How many times have you heard that? This kind of news has been a staple of local weather forecasts for decades. And if you’d been keeping track, you would have noticed something curious. The number of days that produce sweltering record high temperatures has been eclipsing the number of days with frigid record lows. That trend – a different way of measuring how the climate is warming -- has just been documented by researchers at the National Center for Atmospheric Research (NCAR) in Boulder, Colo. and their colleagues. They found that from Jan. 1, 2000 through the end of last September, there were twice as many record highs reported as record lows: 291,237 highs vs. 142,420 lows. The disparity is especially marked in the western half of the country, and it has been widening nationally for the last 30 years. At Environmental Working Group, which is pushing for a strong climate bill to protect our food supply and natural resources, Mid-West Vice President Craig Cox said the new data confirms once again that Earth’s warming trend is already a day-to-day reality that requires urgent action. He noted that the devastating damage being done to Western forests by mountain pine beetles is partly due to warmer winters that help the insects to flourish and spread. The new study’s findings emerged from millions of high and low temperature readings taken over six decades from about 1,800 weather stations across the country that have been operating since 1950 – a lot of data. Meehl worked with colleagues from the National Oceanic and Atmospheric Administration, Climate Central and The Weather Channel to assemble and analyze the numbers. The data shows that in the 1950s the number of record high and low readings was almost even: 1.09 to 1. In the 60s and 70s there was a modest excess of record lows, but since the 80s the highs have been steadily pulling ahead. "If the climate weren't changing, you would expect the number of temperature records to diminish significantly over time. As you measure the high and low daily temperatures each year, it normally becomes more difficult to break a record after a number of years. But as the average temperatures continue to rise this century, we will keep setting more record highs." 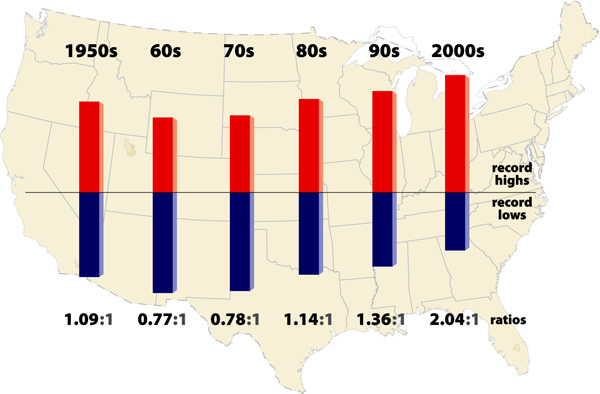 The study illuminates another feature of the nation’s shifting climate. The rising ratio is driven more by a shrinking number of record lows than by a larger number of record highs. That shows that the rise in temperature is more dramatic at night, when temperatures aren’t dropping as much or as fast as in the past. This is exactly the shift that computer climate models had predicted. Scientists understand pretty well why temperatures are warming more at night than in daytime. The team’s paper is scheduled for publication in the peer-reviewed journal Geophysical Research Letters.